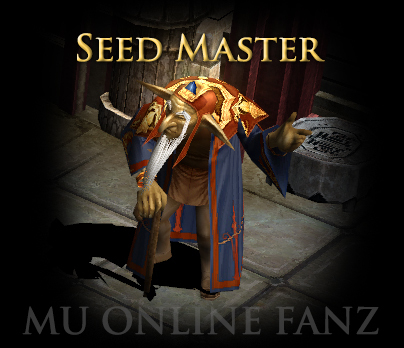 Seed Master <+> [MU Online Fanz] <+> Official 3rd-party [MU Online] Fan Site & Game Guide! The [Seed Master] is the expert of [Socket Items]! He can craft [Seeds], [Seed Spheres], and better [Socket Items] for you, and can also apply or unsocket [Seed Spheres]! He is a very knowledgable guy! [Seeds] and [Seed Spheres] can be crafted via NPC [Seed Master]. [Seed] is created by refining [Ancient Item] and [Excellent Item]. [Seed Sphere] is created by combining a [Seed] item with [Sphere] item. The combination can not fail. [Seed] item is created of a random [Element Type]. [Seed Sphere] [Lv. 1] item is created. The [Element Type] corresponds to the [Seed] used in the combination. Seed Spheres can be upgraded via NPC Seed Master. Base Seed Sphere item does not downgrade. All other ingredients are destroyed. Base Seed Sphere item increases [Item Level] by one increment. To upgrade seed spheres, the ingredient seed sphere must have identical [Item Level]. Sphere Upgrade Rune Capsule is sold via NPC Priest James, for 10 Ruud each. Sphere Upgrade Rune Capsule can be opened to receive [x1 ~ x3] Sphere Upgrade Rune. The combination will always remove both [Socket 4] & [Socket 5]. [Seed Sphere] items should be removed from [Socket 4] & [Socket 5] before the combination. After the combination, the [Item Level] and any other options will not change. 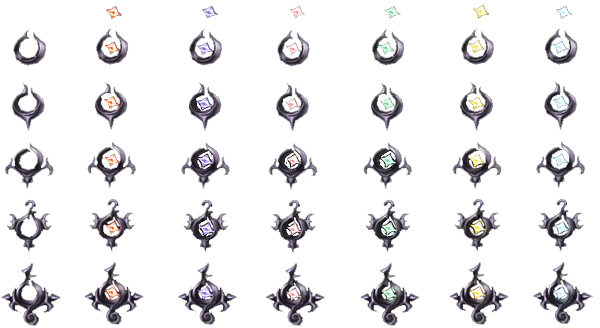 The feature is mostly to be used by [Elf] characters, as they can equip weapon items which total to more than 5 [Sockets]. Mastery [Socket Item] weapons can be crafted via NPC [Seed Master]. [Jewel] and [Combination Note] is destroyed. [Socket Item] in combination does not downgrade. Mastery [Socket Item] [+0] weapon is created. 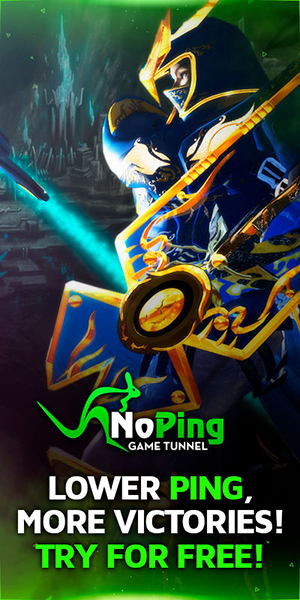 Existing [Luck], [Skill], and [Socket] options are transfered from the [Socket Item] used in the combination. [Socket Upgrade Note] is sold via NPC [Priest James]. [Socket Item] [+11] [2 Socket] is the minimum requirement for the combination; greater [Item Level] and [Sockets] will work as well. Mastery [Socket Item] shields can be crafted via NPC [Seed Master]. Mastery [Socket Item] [+0] shield is created. Mastery [Socket Item] armor can be crafted via NPC [Seed Master]. Mastery [Socket Item] [+0] armor is created, based on the [Socket Item] used in the combination.